Small boxes are good to have for all those little trinkets that seems to amass everywhere. So, here is another one from Fabergé! It was made by workmaster Mikhail Perkhin, sometime between 1896 and 1903. 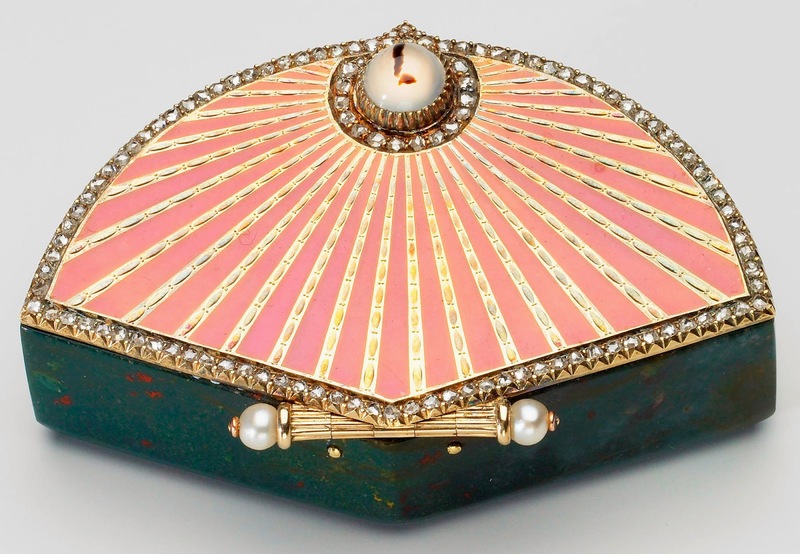 The fan-shaped box is made of bloodstone, with a lid is of alternate tooled gold and pink guilloché enamel stripes. Around the edge runs a line of brilliant diamonds, and diamonds also encircle the cabochon moonstone pushpiece. The hinge, shaped as the handle of the fan, is made of gold and set with two pearls. The measurements of the box is 0.8'' x 2.2'' x 1.5'' (2 x 5.5 x 3.9 cm). and since 1953 it has been part of the Royal Collection.